BOSTON (October 22, 2014) — On Thursday, October 30 at 6pm, the Edgar Allan Poe Bronze Bust Project will unveil the recently completed Poe bust to an audience of literary fans in the Abbey Room McKim Building at the Boston Public Library. Sculpted by Bryan Moore, the bust is the endgame of a successful Kickstarter funded in part by prestigious donors and creators at the top of their games, such as Guillermo del Toro, Neil Gaiman, George R.R. Martin, and Peter Straub. Attending will be Moore; Boston filmmaker Izzy Lee; Boston College English Professor and Poe expert Paul Lewis; and Jeffrey Combs, the talented character actor who plays Poe in “Nevermore: An Evening with Edgar Allan Poe,” which Moore and Lee are co-producing. The play runs for one performance the next night at the Somerville Theatre on October 31st at 8pm. On creating the bust, Moore quotes the great Leonardo da Vinci: "Art is never finished, only abandoned.' That's very apropos of my feelings whenever I finish a portrait, and Poe is no exception. Spearheading a project of this magnitude is always such a monumental task. My producing partner Izzy Lee and our incredible project team truly allowed me to shut off the business of running a fundraiser and focus solely on the sculpting. Long hours in the workshop were often accompanied by the usual bugbears of any artist; doubt and the inevitable insecurity of wondering if it will ever be "good enough." While I think so, the ultimate judgment lies with you; the project supporters, donors, and kind folks who offered encouragement and never allowed me the luxury of settling for second best. "So for all of you, the fans of Poe, I hope you'll forgive me for walking away and abandoning our beloved Edgar, as I could keep sculpting his arresting countenance forever. It's my sincere hope that you'll give me permission to do so, and return him to the city of his birth and whisper: 'Welcome home, sir." The author of The Raven, The Tell-Tale Heart, Annabelle Lee, The Cask of Amontillado, and The Black Cat, Edgar Allan Poe died a pauper, but became a celebrated literary figure after his death. Now part of the canon of American literature, Poe is taught in schools, adapted by filmmakers and theatre companies, and beloved worldwide. On the evening of October 30th at 6pm, fans, onlookers, and the modern day literary elite will see Poe return to the city in which he was born—welcomed, acclaimed, and in bronze for all time. 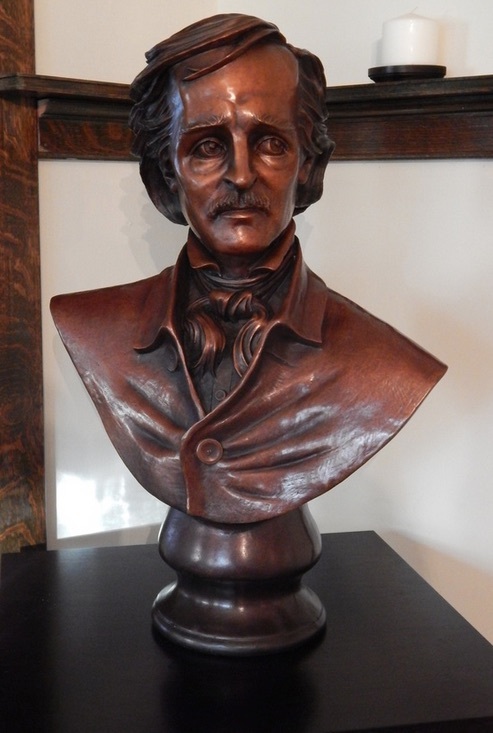 For more information on Nevermore and the Edgar Allan Poe Bronze Bust Project, visit: https://www.facebook.com/EdgarAllanPoeBronzeBustProject. Poe Forevermore is a proud sponsor of The Edgar Allan Poe Bronze Bust Project.